Remember Deepika Padukone and Kalki Koechlin posing for cameras with their mehndi designs in Yeh Jawani Hai Deewani? Or the long list of wedding-related songs like ‘mehndi lagake rakhna’ from DDL J or ‘London Thumakda’ from Queen? With all of Bollywood secretly promoting mehndi, it’s safe to say that the traditional practice of mehndi has become mainstream. ‘Mehndi ki raat’ is considered to be one of the most fun pre-wedding functions that have a lot of fun, masti and sho-sha associated to it. This ceremony has become popular with new designs cropping up and more brides opting for something unconventional and unique. With the advent of new mehndi designs in the market, there is always a motif that grabs the attention of the bride-to-be and she prefers getting a specific mehndi design for her wedding day. So, this wedding season, we have listed some of the most stunning traditional Indian mehndi designs that have been in trend and you’ll love to incorporate it on your wedding day. Flowers look great with any bridal outfit and have always been a part of Indian weddings, in some way or the other. Even for mehndi, floral designs have been a hit among the brides since the longest of time. With flower designs of various sizes, this style looks very pretty yet very intriguing. This mehndi design has been popular amongst a lot of Indian brides and reminiscent of the Mughal era. It includes domes and pillar designs with specific patterns like chequered or split patterns, which are beautiful as well as striking. This design is relatively new and uses a lot of glitter and stones in it to make your mehndi stand out. You can choose the kind of colour you want to apply along with the mehndi to make it look interesting and give it a different look. More and more brides are experimenting with coloured mehndi designs even though it’s not the old school, traditional mehndi design. 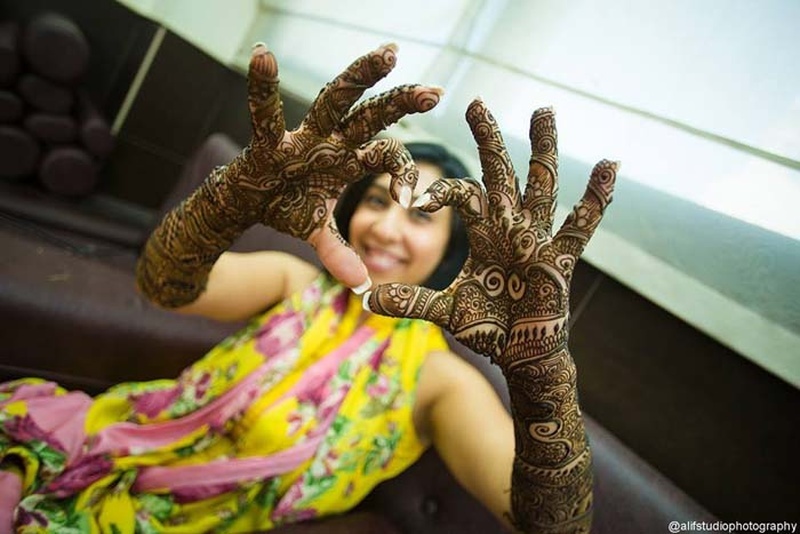 Circular mehndi designs have always been a fad when it comes to weddings. If you ask your grandmothers, they will tell you how popular they were in those times. This simple design covers your fingers with henna with a small circle at the centre of the palms. If you want to keep it simple, opt for circular motifs that are elegant and extremely alluring. This design is a classic. The very popular mango design is one of the famous types of paisley patterns. Many tiny paisleys put together intricately create a beautiful yet delicate design, making the mehndi look stunning. This design is adorned by many brides-to-be and has still managed to stay popular this wedding season. A peacock design with beautiful feathers and a long peacock’s neck makes it a success, and you could fuse it with other floral patterns and motifs as well. The raja rani design has been a favourite among brides and displays the artwork of a maharaja and maharani of a particular era. The beautiful and intricate patterns form a major focus of the whole mehndi and make the design stand out. Chequered patterns are used to add an intricate look for your bridal mehndi. This design makes your mehndi stand out and is also used to fill gaps. Mehndi is not always about complex designs, flowers or architecture. Some stunning designs include simple lines and patterns that create an appealing look. A simple combination of lines and patterns creates some of the most impressive motifs for your bridal mehndi.